Created, designed, and built by Nikolai Zykov in 1985. Height: 102 cm / 40 in. Materials: papier-mache, foam plastic, foam rubber, wood, metal wire, fabric, lace, feathers. Brazilian Singer is a performer of Lambada. 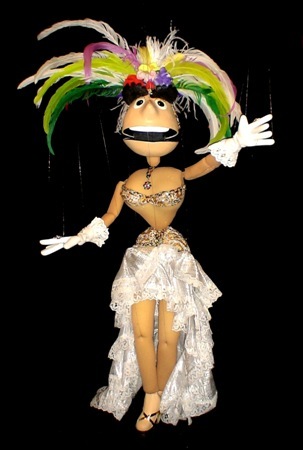 The puppet has original construction of hands for grasping the skirt. See PHOTO ALBUM of BRAZILIAN SINGER. Brazilian Singer in TV show, TVC, Moscow, Russia, 2006. Brazilian Singer on stage, TV Doverie, Moscow, Russia, 2011.